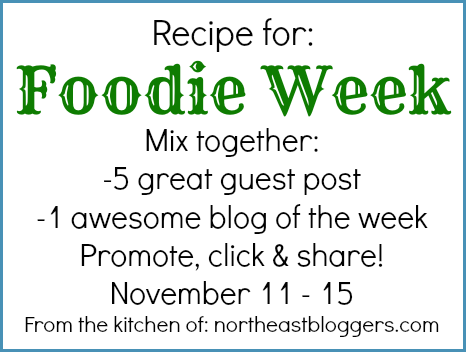 This week’s blog of the week is, of course, one of our fabulous food bloggers! The blogger of the week is Peggy who write over at Spiced Peach Blog! Spiced Peach is about anything related to food, the main ingredient, an open table to all. authors, cooking professionally in restaurants. these foods too and I hope to share many of them with you. an idea to share I would love to hear from you! believe would be helpful to your dish preparation. full and you will never feel a lonely moment. Wishing you a very full life along the spice road of food and friendship! Thanks Peggy! Be sure to check out Spiced Peach this week and say hi! Peggy is very active in our Facebook community and also returns the comment love! Stay tuned for more Foodie Week fun! Peggy's one of the nicest bloggers I've met through this community. She's always so pleasant and friendly to her fellow bloggers. Congrats on being featured, Peggy!